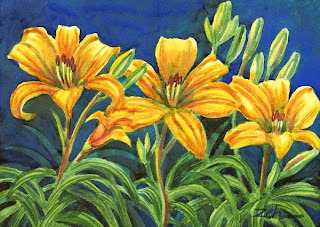 This painting brings me back to mid summer when the lilies were blooming. Daylilies are great for brightening up the perennial garden during a time when many other flowers are past or not yet blooming. They don't mind the heat, require little in the way of watering and just keep blooming! Here I painted them against a deep blue background to enhance the bright yellow flowers. I like how the graceful leaves and stems add movement to the painting.